Call 1-800-256-5186 or e-mail team@aaerial.com for availability and questions on rental requirements. 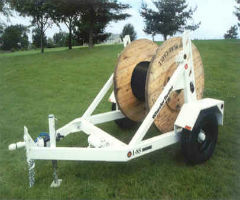 The selection of the HYDRA 985 as your cable-pulling unit can save hundreds or thousands of dollars on any given job. Line construction experts will tell you the highest costs of any job are in the set-up for a pull. Manpower and equipment required can eat up any job budget. That is why the self-loading, self-maneuverable HYDRA 985 beats the competition. Manpower is used efficiently and supporting equipment requirements are nearly eliminated. No other unit on the market can measure up in terms of overall job economy. 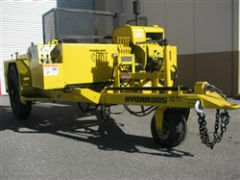 6,000 pound payload capacity, manual hydraulic pump, flow divider, internal cylinders, electric brakes, breakaway kit, electric junction box, drop leg jack, safety chains, certification holder, and DOT compliance stickers.Trailer Specifications:Length: 132 inches Width: 96 inches Trailer weight: 1400 lbs Reel Diameter: 120 inches Reel Width: 60 inches. Slabach Model I-85 Reel Trailer features 8,500 pound payload rating, manual hydraulic brakes, flow divider, internal cylinders, electric brakes, breakaway kit, electric junction box, drop leg jack, safety chains, certification holder and DOT compliance stickers.Trailer Specifications; Length: 132 inches Width: 96 inches Trailer weight: 1600 lbs Reel Diameter: 120 inches Reel Width: 60 inches. The Condux APS75 Hydraulic Underground Cable Puller provides up to 7,500 lbs of continuous pulling power to tackle some of the toughest pulling applications. It now features an efficient Tier 4 Rated 49HP engine. Designed for installing underground cable, the APS75 is completely self-contained and transports easily from jobsite to jobsite. Industry leading features like antitwist rope, digital monitoring, rotating pulling arm and wired remote control make the APS75 the most advanced pulling system on the market today. The APS75 is precision manufactured to the highest standards. Each puller is backed with years of underground cable pulling experience and a commitment to quality customer service. The fiber optic cable puller is a hydraulic pulling machine designed for fiber optic cable placement. 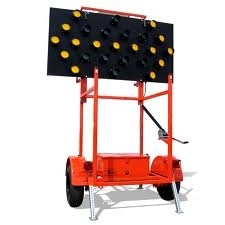 It offers bi - directional pulling and load - sensing capabilities. The system uses a hydraulic motor and capstan with an electronic tension control system. 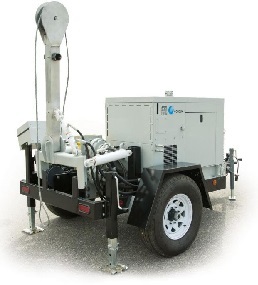 The trailer offers the platform for a self - contained cable pulling system with a hydraulic power system including a hydraulic power source, cable puller mounts, leveling and stabilizing hardware and several lockable storage areas. Arnco 361/TM hydraulic power unit with foot control and 4" x 30" capstan. Condux G-16S08-58 hydraulic power unit with foot control and 8" x 30" capstan. The solar guide is an arrow board trailer that is built to preform while still offering a great value. 11 pre-programmed display functions are easily accessible with the user friendly control box. A high efficiency solar charging system is incorporated into the compact sized trailer to the compact sized trailer to create a system that is both self contained and portable. Over the course of our 35 year history in the trailer manufacturing industry, Brooks Brothers has become a leading trailer manufacturer that utility and construction professionals turn to for their equipment needs. 22,000 lbs. 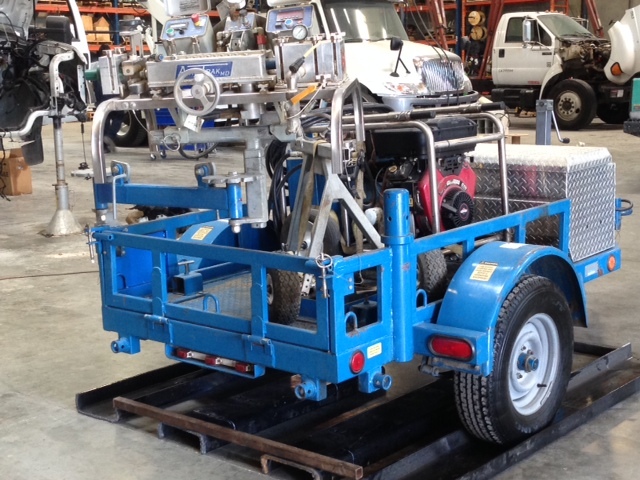 GVWR - calculated at 10% weight transfer to tow vehicle. 17,700 lbs. load capacity (based on 10K axles). Roose SL-35 Multi-Reel Rear Hydraulic Load Standard equipment includes: electric hydraulic pump, drop-leg jack, 12 volt electric brakes, breakaway kit, painted yellow or white, 6 Pole electrical connector, safety chains, rear jack stabilizers (removeable) and Dextor Torflex Axles.Trailer Specifications: 3 reel capacity / Payload: 3500 lbs. 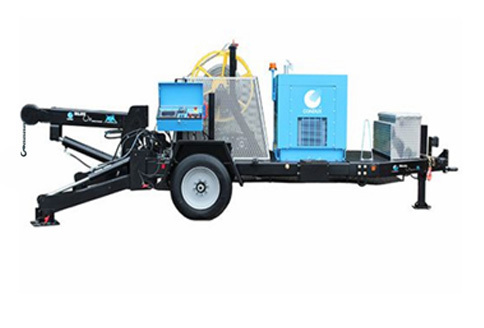 per reel Length: 30' 6" Width: 102" Weight: 3800 lbs Reel Diameter: 60-125" Reel Width: 60"
Fiber blower trailer with power pack, blowing lube, and additional couplers. Fiber optic cable blowing is one of the most efficient, and safe means of installing fiber optic cable. A pulling force combines with a pushing force to cause the cable to travel through the duct like air. Today's fiber optic cable installations benefit from the pressurized blowing system because it provides greater installation speeds with less stress then traditional cable pulling. This trailer can be shipped anywhere in the continental US by Fed-Ex freight.